The objective of this book is to provide a single reference source for those working with dairy-based ingredients, offering a comprehensive and practical account of the various dairy ingredients commonly used in food processing operations. The Editors have assembled a team of 25 authors from the United States, Australia, New Zealand, and the United Kingdom, representing a full range of international expertise from academic, industrial, and government research backgrounds. 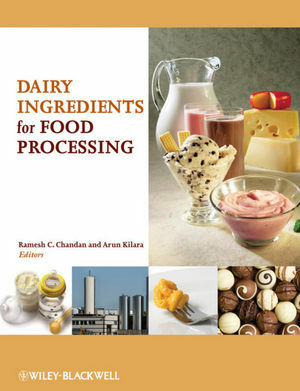 After introductory chapters which present the chemical, physical, functional and microbiological characteristics of dairy ingredients, the book addresses the technology associated with the manufacture of the major dairy ingredients, focusing on those parameters that affect their performance and functionality in food systems. The popular applications of dairy ingredients in the manufacture of food products such as dairy foods, bakery products, processed cheeses, processed meats, chocolate as well as confectionery products, functional foods, and infant and adult nutritional products, are covered in some detail in subsequent chapters. Topics are presented in a logical and accessible style in order to enhance the usefulness of the book as a reference volume. It is hoped that Dairy Ingredients for Food Processing will be a valuable resource for members of academia engaged in teaching and research in food science; regulatory personnel; food equipment manufacturers; and technical specialists engaged in the manufacture and use of dairy ingredients. Ramesh C. Chandan, Ph.D., is a consultant in dairy science and technology and has worked for more than 40 years in various food companies, including Unilever, Land O'Lakes and General Mills, with special expertise in the manufacture of dairy products. He has served on the faculty of Michigan State University and has taught dairy technology courses for seven years. He has authored/edited six books on the subject of dairy food science. Arun Kilara, Ph.D., also a food science consultant, has long established expertise in teaching and research in dairy food science at Penn State University and is very well known for his contribution in the area of dairy ingredients. He has edited two books on dairy food science.